Home » Food » Food Review: Kra Pow Thai Street Food at Far East Plaza | A Taste of Thailand at this Hidden Gem in Orchard! The Place Far East Plaza is a sleepy mall the past few years and we almost missed out on a good restaurant just because we have already crossed out the mall. Kra Pow Thai Street Food located at level 3 of the mall near Orchard Road is a hidden gem. The casual eatery, where “Kra Pow” means holy basil in Thai, is spacious and offers affordable Thai food. There are more than 20 dishes in its extensive menu where you make your order directly at the counter, which explains why there is no service charge and GST. The restaurant was considerably packed during our weekend visit, though the kitchen was fairly efficient and we didn’t wait too long before our food arrived. The Food The menu is so extensive that I was so tempted to try so many dishes, and my note to self is to come with a bigger group next time. I spotted the usual favourites such as tom yum soup, grilled pork collar, mango salad and sea bass on the menu but didn’t manage to try all of these dishes this time. Instead, we started with the Thai Wings (S$6.90) as we were craving for something fried and sinful. The crispy wings are very thin, just like the ones we had in Bangkok. This is pretty addictive. The seemingly harmless looking Dry Suki Seafood Noodles (S$9.90) is quite spicy. This plate of stir fried glass noodles is tossed with eggs, prawns and fish. The flavours are quite hearty, and be warned that the spiciness take awhile to hit the palate. 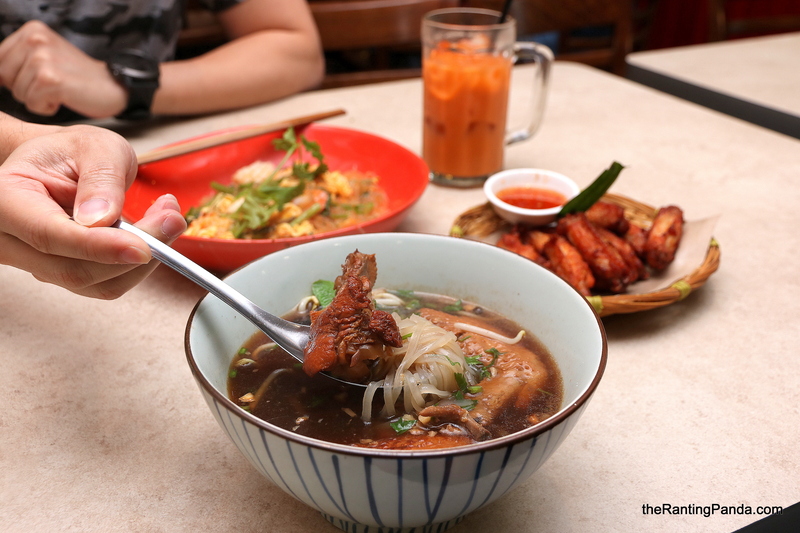 Conversely, the Stewed Chicken Noodle (S$7.90) is a very comforting dish. The broth is thick, not too salty and is perfect with the thin noodles. It actually reminded me of the duck noodles I had in Chaktuchak Market, though it is chicken meat here instead. For drinks, look no further than the obligatory Thai Iced Milk Tea (S$3.90). Rants This is a casual diner, and you will have to grab your own table before heading to have your orders made at the front of the shop. Collect your utensils and wait patiently for your orders to be served. You get the spin. Will I Return Again? With no service charge and GST, it is not difficult to see why Kra Pow Thai Street Food is so popular. The food is good and authentic, while prices are very reasonable. I will be back to try the other dishes.